Following the shocking apparent suicide of their friend Dean, four Spingwood teens discover they are all having the same nightmares of a murderous burnt man wearing a razor-fingered glove. Their quest to get to the bottom of this mystery is hindered by their parents, who are clearly trying to keep the kids from discovering something forgotten about their own pasts. Eventually, the truth is revealed – their parents hunted down and killed the janitor of the preschool they all attended, who they believed was molesting their children. Now, that janitor – Freddy Krueger – has somehow come back to haunt their dreams. And if he kills you in your dream, you die in real life (you know the drill by now). In the end, it’s up to the young and now sleep-deprived Nancy Holbrook and Quentin O’Grady to follow the clues to uncover their true connection to Freddy, and to rid him from their dreams before it’s too late. Look, I’m not going to go into a rant against the idea of remaking A Nightmare on Elm Street. I get it. Many fans complained this new version was little more than a soulless cash grab by the production company, Platinum Dunes. For one thing, I’m not convinced this is entirely true. Freddy, like Dracula or Frankenstein’s monster, has simply entered the pantheon of unforgettable horror icons, and it’s only fitting that he too will now be revisited and reworked every generation or so. There’s really nothing wrong with that. But even if this is just Platinum Dunes looking to make a quick buck…so what? To criticize them for that is to ignore that nearly every Nightmare film was looking to do the same. If you want to bemoan the idea of profit over art, that’s fine, but don’t you dare suggest this is the first time Freddy has been used this way. Oh, sure, Craven had slightly more noble intentions with his first movie (and probably New Nightmare, as well), but you can’t tell me New Line wasn’t just trying to profit off of what he created with every subsequent sequel. The horror genre is a business, and studios shouldn’t be faulted for bowing to audience demand. How dare they suddenly start trying to make money off these things, huh? Really, I was all for the overall idea of a Nightmare reboot. I’m one of those weird horror fans that not only doesn’t mind remakes, but actually usually supports them. And I know the Freddy character is still a strong and viable commodity, and that there are plenty of fans who would still like to see new Nightmare films. Given Robert Englund’s increasing age and his admitted desire to leave the character behind, not to mention the overwhelming and, quite-frankly, confusing continuity of the original series, a reboot was really the only logical choice for the franchise at this point. That’s fine by me. But, still, even I have to ask – what’s the point of making a Nightmare on Elm Street remake like this? What’s the point of taking one of the most original and imaginative horror films of the modern era, and re-creating it as nothing more than a loud and monotonous parade of easily-telegraphed jump-scares? The reason I was initially excited about a Nightmare remake is because filmmaking technology has finally caught up to the potential of the marvelous concept Wes Craven created. It’s not that the early films were hampered by their lower budgets, per se…but it’s undeniably intriguing to consider what sort of fantastic and surrealistic dreamscapes Craven and the other Nightmare filmmakers could have delivered with the budget and resources of today’s high profile movies. Now, here we have a Nightmare movie that could feasibly deliver on that promise – that could marry Craven’s unique vision and thought-provoking story with the sort of top-of-the-line FX it deserves. This could have been the Nightmare film that we grew up…ahem…dreaming of. Instead, director Samuel Bayer and his collaborators have oddly dumbed down the whole thing – changing the feel of the series to little more than just another generic slasher, while also inexplicably steering clear of the sort of outrageous and unbelievable nightmare sequences that I think most fans would expect of a modern Nightmare on Elm Street. I never expected a remake to register on the same intellectual level as Craven’s film…but I at least thought it could push the visual boundaries and deliver on a purely visceral level. No such luck. I will give them this, at least – the film isn’t just a rehash of the original. 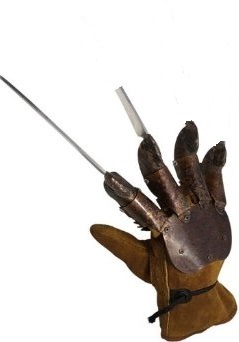 Trailers for the remake showed a number of moments taken directly from Craven’s original (the Freddy-wall gag, the gravity-defying death of a teen girl, Freddy’s glove in the tub), leaving many worried this was going to be one of those remakes that hews way too close to the original. Those are the kind of remakes that piss me off, and I feared this was just going to be a case of showing how Craven’s scenes could be improved (or at least expanded upon) with modern FX, as if anyone was really supposed to be impressed by that. We all know that you can probably pull that stuff off with a slightly higher technical quality…but it doesn’t change the fact that it’s still the exact same scenes we’ve already seen before. …but overall, the movie seems surprisingly unconcerned with doing anything too memorable with its nightmare sequences. More often than not, the potential victim simply “comes to” in the exact same location they were in when they fell asleep (just with different lighting and spookier music), or they’re in Freddy’s boring old boiler room. And Freddy doesn’t seem all that interested in using his reality-bending powers to torment the kids or anything. In this movie, he simply exists to constantly jump out of shadows and from behind walls, always accompanied by an ear-shattering wail of noise that is supposed to serve as a substitute for any real sense of tension. This is the movie’s greatest failing – it has taken one of horror’s most charismatic screen villains and turned him into nothing more than a living musical sting. It seems to me that the best way to avoid this version of Freddy would be to simply stand still and never turn around…it’s when you turn around that he always gets you. And it’s too bad, because this movie did clear one of its biggest potential hurdles – it found the right Freddy. Of the major horror franchises, none are as defined by a single performer as Nightmare on Elm Street. The thought of anyone besides Robert Englund slipping on the razor glove was almost impossible to wrap one’s head around. Jackie Earle Haley, though, was an inspired choice. In fact, he was only offered the role after an Internet rumor suggesting he might be up for it led to overwhelmingly positive buzz from the fans. I’m happy to report the fans’ enthusiasm for Haley was justified. In the moments when the movie actually allows him to deliver a performance, he is perfect, mixing just the right amounts of creepiness, dark humor, and vengeful outrage. He’s not better than Englund, but it’s not really fair to say he’s worse, either. He’s just different…and that’s exactly what this Freddy needed to be in order to separate this new Nightmare universe and give it its own identity. Sadly, though, there are couple things working against Haley’s performance, even besides the film’s lazy treatment of “Freddy as scare-machine.” For one thing, there’s the make-up. It’s not that it’s a bad make-up job, but there’s an inherent problem with it. 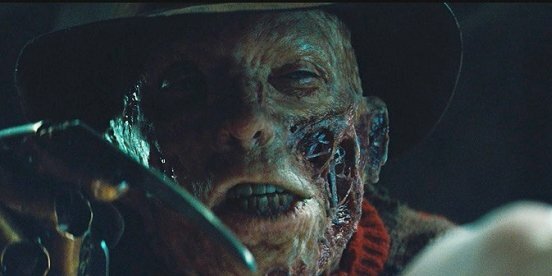 Maybe the filmmakers think there’s something to be said for going the “realistic burn-victim” route, but the unfortunate result kind of robs Freddy of some of his personality. Because his features are less “human” than Englund’s version, it’s not easy for Haley to be as expressive as his predecessor was. They pretty much had to revert Freddy back to a scarier, more mysterious figure this time around – I don’t even think this make-up would allow Haley to deliver a memorably sinister smile…at least not one as gleefully demented as Englund was able to show off. Plus, there’s the problem of Freddy’s new-and-not-really-improved origin. Now, the much-talked-about “molester angle” wasn’t exactly brand new – Krueger was a child molester in Craven’s original script, but the idea was dropped so as not to be seen as exploiting a number of real-life cases that were big in the news at the time. Still, it was always hinted at in the early films, before Freddy’s Dead actually just came right out and said it (odd that the goofiest Nightmare film would be the first one to actually vocalize Freddy’s most disturbing aspect). The remake brings the idea right back to the forefront, basing the entire dramatic thrust of the story on Krueger’s perversion, what it did to these kids, and how it set the current events in motion. I have mixed feelings on this. Having the thought of child molestation hang so thickly over the film’s proceedings brings an unpleasant vibe to the whole thing…but then, I guess you could argue that’s what horror should do, to some extent. The problem, though, is that simply making Freddy into a molester, and removing the “child murderer” aspect, ends up rendering the post-death Freddy’s actions somewhat nonsensical. Why did this seemingly simple-minded pervert become a malevolent, one-liner spouting serial killer after death? Why is he going after these kids (who he supposedly loved, in his own sick way), instead of the parents who killed him? Heck, why does he even have the razor glove? If he wasn’t killing the kids, why did he bother to wear this thing, that only served to leave behind undeniable evidence of his actions? Didn’t these questions occur to anyone while making the movie? No, probably not. 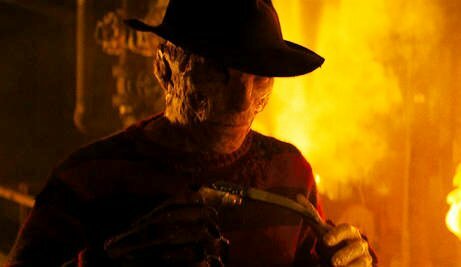 Screenwriters Wesley Strick and Eric Heisserer clearly see the molestation angle as an easy way to make us shiver uncomfortably; to really hammer home how sick and evil Freddy is…but they never even bother to follow through on the rather obvious story benefits of such a revelation. For instance, take the film’s opening diner sequence. This was clearly meant to echo the similar tone-setting pre-title sequence in the Friday the 13th remake, and although it’s a little silly how it basically serves as a main character roll-call, it is an admittedly efficient and somewhat awesome sequence. And the death that ends it, which Freddy makes to look like an obvious suicide, sets up an intriguing element that the film then just ignores. Here’s a group of kids whose parents know have horrible repressed memories. 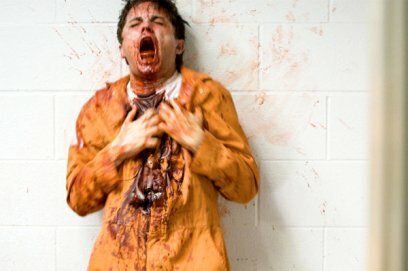 If every subsequent death had been made to look like a suicide, it would have added an extra level of tension to the film, as the adults would have been forced to confront the idea their decision not to get their kids the help they needed has now led to memories flooding back and causing them all to take their own lives. But, nope, never mind that! The diner death is the only one that could be reasoned away as a suicide. In fact, one of the eventual deaths is so inexplicable, I can only imagine how the town’s adults would have rationalized it – although, this is also the same death that hilariously leads to one of the kids proclaiming “he died in his sleep!” Really? Uh, his chest exploded! And there was a witness! I think this sort of goes a little beyond “dying in his sleep,” don’t you? He died in his sleep?? And let’s talk about the kids and their parents (aka, the characters that aren’t Freddy) for a moment, shall we? Here’s another problem with the “hidden past” approach. Sure, it’s more realistic to have these kids be sullen and withdrawn – it only makes sense given what they’ve gone through. But it also makes them far less appealing as characters. Maybe Heather Langenkamp’s girl-next-door Nancy Thompson wasn’t the most interesting character ever created, but she was likable and sympathetic and you got behind her as she was pulled into an awful nightmare that she could barely comprehend. 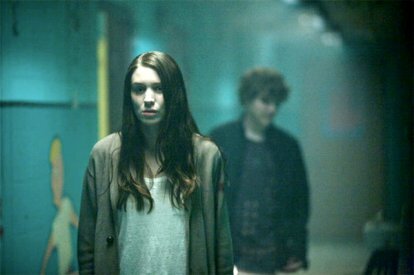 I never feel any such connection to Rooney Mara’s morose Nancy Holbrook, who spends the entire length of the film brooding and pouting as if she’s wandered into a Twilight movie. The rest of her classmates don’t fare much better, although I’ll give Kyle Gallner and Katie Cassidy some credit for at least trying to bring something to their roles of Quentin and Kris (in fact, the movie might have benefited from keeping the focus on Cassidy, who displays a far more charismatic screen-presence than Mara). I don’t know, maybe these kids never had a chance of being relatable people, given the complete morons they were raised by. After all, these are people who were desperate to keep their kids from finding out about the tragedy that once befell them, but rather than just destroy any evidence, they instead hid it in easily-accessible places like the attic or behind a desk drawer. Good call. Oh, I guess I’d be remiss if I wrapped up this review without talking about the addition of “micro-naps” to the Nightmare universe. This is another element I have mixed emotions on. On one hand, it’s clearly a cheat enabling the filmmakers to just have Freddy show up whenever the hell they want, and thus adhere to their apparent “a jump scare every two minutes” quota. But, on the other hand, at least it is something new, and it leads to one of the film’s few truly memorable sequences, as Freddy slashes in and out of Nancy’s reality during a late-night visit to a pharmacy. So I’ll be nice and call it one of the movie’s minor successes. So even if I wasn’t appalled by the movie’s reasons for existing, I was definitely disappointed by the film itself. I wanted to be blown away by this new take on Freddy, but I wasn’t, not by a long shot. This isn’t me just comparing it unfavorably to the original, either. Even judged on its own merits as a stand-alone film, the new Nightmare is simply too clichéd and way-too-reliant on easy jump-scares, and regrettably saddled with unlikable and uninteresting characters. Its faults are made all the more frustrating when they unfortunately outweigh a few very good things – the sequences I liked (the diner sequence, the pharmacy scene, the pretty-cool final jump), I really liked; and Haley is the right guy for the job. There’s a suggestion of a decent movie here, but it never quite breaks through the wall of oppressive monotony surrounding it. Of course, the Nightmare franchise has bounced back from terrible films before, so maybe it will eventually do so again. I might not have enjoyed this one all that much, but I welcome the idea of more – I just hope a little more thought goes into it this time, and that they finally open up the immense possibilities of Freddy’s world. There’s a much better movie to be made with this material, and both the fans and Jackie Earle Haley deserve that movie. We actually learn about a few other kills Freddy has managed across the country, but for the purposes of this column I’m sticking to the kills we see on-screen. And no, I’m notincluding Kris’ dog…I’m fairly sure that was just in her dream. While it’s undeniably an attempt to out-do the original film’s surprise ending by making it even bigger and badder, I still have to admit to digging the ultra-brutal dispatching of Nancy’s mom in the film’s final seconds. You gotta hand it to Freddy…he sure knows how to end a movie. 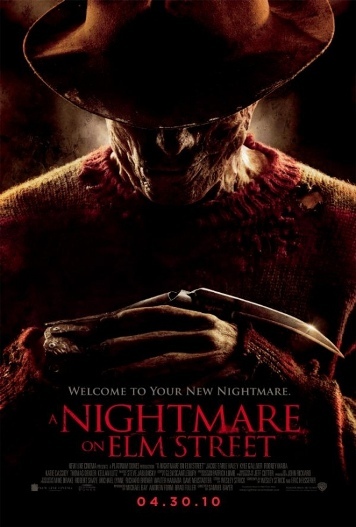 Posted on December 10, 2014, in A Nightmare on Elm Street, Franchise Post-Mortems, Reviews and tagged A Nightmare on Elm Street, Freddy Krueger, Horror Movies, Jackie Earle Haley, Jump Scares, Katie Cassidy, Remakes, Rooney Mara, Slashers. Bookmark the permalink. Leave a comment.